We are proud to say that with our 10 years of building science experience, Southern Energy Management is the founder of ecoSelect. This program focuses on simplicity and expediency with a one page checklist and less administrative work. It uses straightforward standards proven to increase energy efficiency, a web based management system to provide support, and third-party verification to assure quality control and consumer confidence. 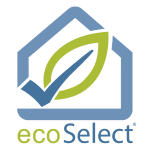 Builders seeking ecoSelect certification on their homes will be certified either by us or a certified, independent third party. Communicate to your buyers that you are committed to high performance utilities and building methods through this program. Let us help you get your ecoSelect certification and learn why Southern Energy Management is a six time ENERGY STAR Partner of the Year and a 2011 NAHB Research Center Green Partner of the Year.